involves considerable overlap and feedback among the activities. contracting process must be sensitive to the context in which the change is taking place. partment and group effectiveness. Individual-level issues involve the way jobs are designed. meeting minutes and organization charts. It also explains how data can be reviewed and analyzed. design interventions to achieve the organization's vision or goals and make action plans to implement them. current change capability, its culture and power distributions, and the change agent's skills and abilities. Human process interventions at the individual, group, and total system levels. Interventions that modify an organization's structure and technology. Human resource interventions that seek to improve member performance and wellness. environment and the internal structure and process necessary to support a business strategy. toward the vision, and sustaining momentum for change. interventions and high levels of participation. organization's context. Thus, planned change can vary enormously from one situation to another. whether the setting is domestic or international. through departments and work groups to individual jobs. communication among members of a work team or low customer satisfaction scores in a department store. resolved. Of course, the change agent may contract to help solve additional problems. rewards, planning processes, work designs, and information systems. It is important to emphasize that quantum change may or may not be developmental in nature. developing their capacity to solve problems and to achieve both high performance and quality of work life. changing and improving themselves continually. organizations, on the other hand, there is too little constraint or regulation for effective task performance. diverse groups and participants must be coordinated around complex, uncertain tasks. communications and confrontation of conflict, and maintains flexibility in relating to the organization. the traditional phases of planned change and include the following four steps. about which departments should be involved in developing a new product or service. communication channels, and specifying appropriate plans and policies. for a North American or European consultant to implement. practitioners trained in the traditional model and raised and experienced in western society. of planned change must be carefully mapped against the cultural context. operational, and political nuances of change in that society. 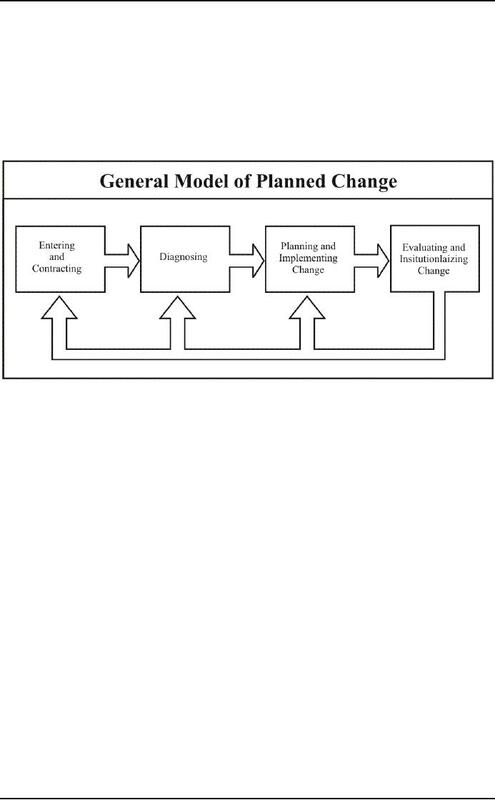 problems with the way planned change has been conceptualized and practiced. and that a good deal more research and thinking are needed to fill the gaps. set of situational conditions. Such contingency thinking is sorely needed in planned change. most effective in certain situations. lutions to most organizational problems. inappropriate. Careful diagnosis can help to avoid such mistakes. members' capacity to carry out change. Case: The Dim Lighting Co.
engineers in his group respect his technical competence and have a high level of morale. will develop a net cash flow of $1 million by the third year. implications, and if they failed to move into new technologies, the firm would be competitively obsolete. the bottom line right now, we may not be here to enjoy it," she noted. also, and that has a very direct payback." called the meeting to a halt. would resign, which would shatter the R&D department he had worked so hard to assemble. Case Solution: The Dim Lighting Co.
Will Dim Lighting be reactive? Will Dim Lighting be proactive? his career in making this budget decision? West feels threatened every time Spinks does not receive his demands or "wish list." Spinks' past history of leaving a company that "lacked creativity and innovation". development of new products and ideas. pressure to improve the profit margins immediately. as a whole may become entrenched in old technology. possibly the parent company would contribute to the R&D project. and come to a consensus-it should not be an all-or-nothing proposition. both R&D and for upgrading essential equipment. best-case scenario, (2) worst-case scenario, and (3) probable scenario. rather than a potential deserter. First try to obtain additional funds from parent company. have to be made on length of time for R&D projects, what equipment is needed, etc.